August 21, 2018—On August 18, 2018, At Round 11 of the AMA Motocross Championship, held at Budds Creek, Maryland, U.S.A., the Monster Energy/Yamalube/Star/Yamaha Racing Team’s Aaron Plessinger, who competed in this season’s 250MX class on the YZ250F, clinched his first-ever AMA Motocross championship one round before the final round of the season. This win brings him up to two titles for 2018, as he also won the AMA Supercross 250SX West title in May of this year. 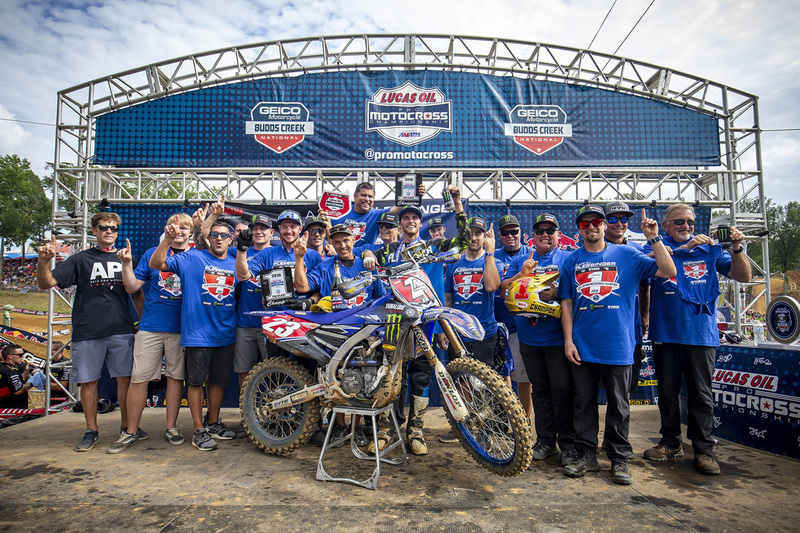 Plessinger made his debut in 2015 in AMA Supercross, then subsequently in AMA Motocross, where he finished 6th overall with a win at the final round of the season. He finished the 2016 season in 5th, then 4th in 2017, showing steady upward progress. This season he has gone back and forth against his rivals for the points lead, but at Round 4 he won both motos, after doing the same at Round 2, to bring himself to the top of the standings. He missed out on winning Rounds 5 and 6, but at Rounds 7 and 8 he once again won by placing 1st in both motos, which opened up his lead at the front. From that point he was steady and strong, and at Round 11 he took his ninth moto win of the season in Moto 1. Plessinger has finished in the top three in 14 of this season’s 22 races. That consistency is what earned him a fantastic first Motocross championship this season.